So after a year and a half of digging and preparation, what do you do with a big pile of bones? Put them together! 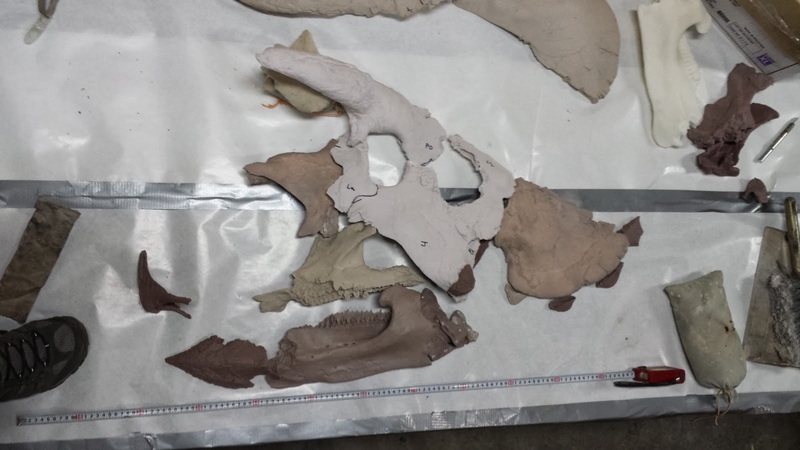 At long last, our Avaceratops project is moving forward and is surprisingly starting to look like something. 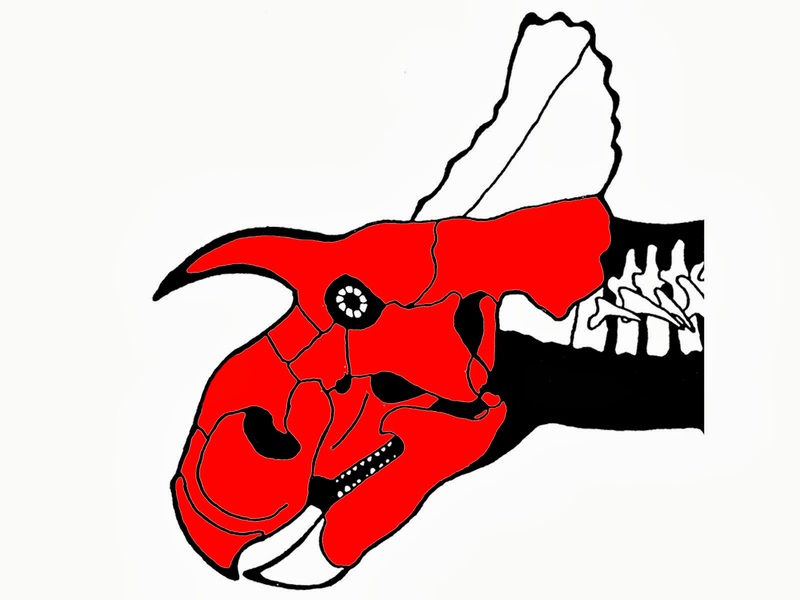 Avaceratops is a fairly poorly known animal, with only 2 partial and fragmentary skulls discovered before this one. Ours is filling in lots of gaps since 1: we have more bones than were known before and 2: the bones that we have are more or less complete, not busted up. This adds a degree of difficulty to the project since all the restorations done before made a few educated assumptions about their missing bits, and not all of those were accurate. Where to start though? In treating this like a giant model kit, we first decided to make all the parts we needed. There will be 60 individual bones to deal with. While we have the lions share of those, we do not have them all. The first step is to mold all the original elements and cast them in plastic. This enables us to mount them and take distortion out without destroying any of the real fossil. Second we identified all the elements that we had one side of and needed the other. Those elements were laser scanned, mirror imaged in software, then printed out in plastic on one of our 3d printers. Lastly, some elements were flat out missing. Those were fortunately few, but they ended up getting sculpted. 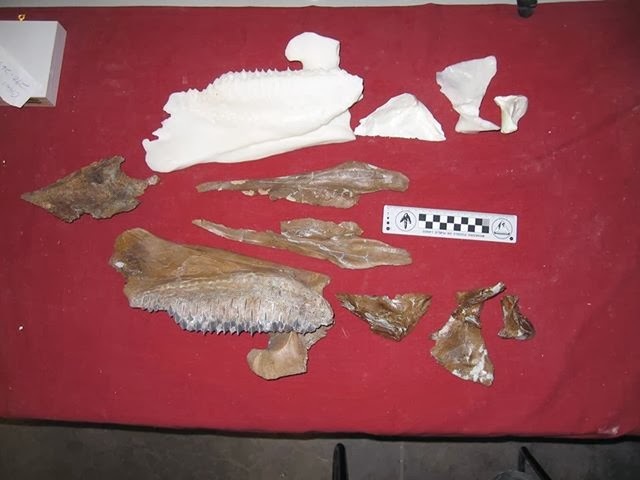 Once the parts were poured, we cut apart a few casts where the bones were glommed together and it was too dangerous to try to pry the fossils apart. After fitting a few parts, some needed to get cut or bent to fit how they were supposed to, taking millions of years of crushing and distortion out. This is much trickier than it sounds. Our frontals were squished just enough in the ground that when the brow horns were attached to the mount, the tips crossed each other. That's probably not how they went in life. The casts were then adhered together into subassemblies ready for molding. Work is still ongoing but we hope to be done in the next week or so with the heavy work. Once the molding is done, the final product will be just 5 parts. Much easier to put together than 60.